Today we begin a new series that explores food and eating in times of collapse. During this Lenten month we’ll travel through different kingdoms and terrains, sharpening our appetites and cooking knives, in the company of artists, filmmakers, writers and activists – starting with an introduction by series editor Charlotte Du Cann. We are looking at a plate. Tiny translucent slices of fish are artfully arranged around its rim. It is 1990 and we are in a Japanese restaurant in downtown Manhattan. ‘Who is going first?’ we wonder and laugh nervously. I am with Hamilton and Steve. We’ll all go at once we decide and put the poisonous raw fugu in our mouths, declaring that a tingling was definitely happening. The dish costs $50. We are looking at a plate. On it piled in chunky layers are home-baked sourdough bread, crispy seaweed and a poached egg. It is 2017 and we are outside in the lee of the Dorset cliffs, cooking on a camping stove. Everyone wants to go first. I am with Caroline, Jack and Mark and yesterday we cut the bright green fronds from the rocks, as the aquamarine sea swirled about our feet. We declare this is possibly the best breakfast we have ever had and laugh. This is a story about food and powerdown. It could seem like a personal story except that it is not: it is a social story about how everything changes when you break the illusions your civilisation is wrapped in. In 1990 I am staying in the Algonquin Hotel, covering the US fashion collections, and I know nothing about the industrial food system; in 2017 I am staying in a hut on a beach, talking about Dark Mountain, and I know all its dark secrets. Decades later the Spring collections will still send beige raincoats down the catwalk and the forests of kelp will continue to wave their ancestral arms in the currents of the English channel – but the world I am documenting, like the food I now cook, is radically different. 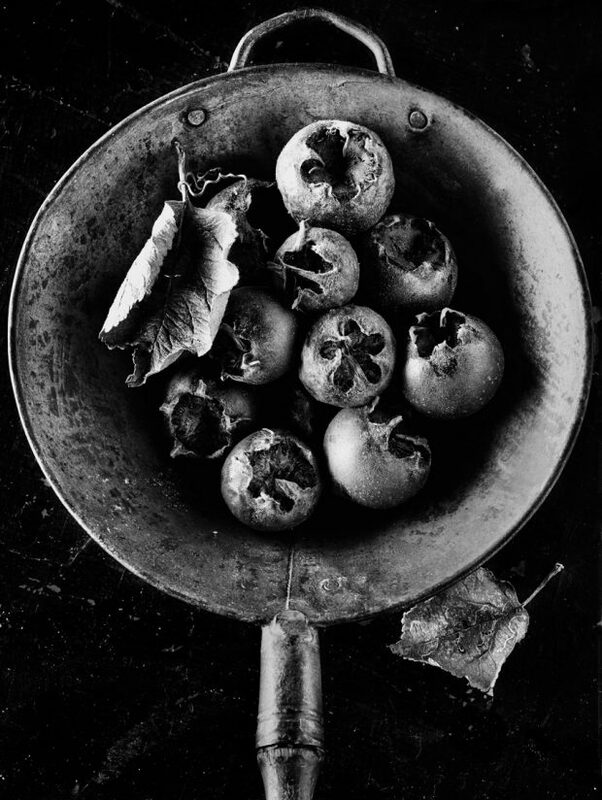 This is a series called Dark Kitchen: a set of pieces that will look at and question the culture of food in times of fall. It’s not a subject Dark Mountain has focused on before, even though writing and cooking share a creative terroir, not least in their ability to bring things to the table, to alchemise raw material into food for the mind, heart and body. Up to now any focus on food has been practical: the Uncivilisation festivals hosted foraging walks, we’ve published pieces on mead making, bread baking in Australia and a recipe for a very rooty, roadkill pheasant stew; this series aims to bring a writer’s and artist’s particular attention to food from a Dark Mountain perspective. Our focus will not be on the labyrinth, the whirlygig of distribution centres and trucks that thunder along our roads, all the data and polemic, but on finding the dancing floor beneath it. Around all our sentences lie the deforested lands, the denuded and poisoned oceans, the lost soil, the vast herds of creatures living and dying invisibly in dark sheds. We know what is going down. Our core question is, once you have railed at the machine that holds us in its palm-oiled maw, what do you do as an artist, as a storytelling human being, knowing that every time you venture out with a shopping basket, you return with blood on your hands? Dark Kitchen aims to gather some of the stories about food that go untold at the edge of our civilisation. All civilisations flourish and flounder according to their ability to feed themselves. All of us, as human animals, no matter where we exist, on what social and political map, need to eat to live. Like death, this is a fact of our existence here. How we can we do that sustainably, with kindness, with fairness, is a question many grassroots organisations and activists ask themselves. One they do not necessarily ask however is: how do we change the story of our lives, built as it is on millions of years of living in hunter/gatherer bodies, thousands of years living in wheat and barley-fed civilisations, in nomadic milk-herding geographies? Food is not a matter of intellectual debate: it is physical and feeling memory, deep time memory, cultural and personal history. It is people and relationships with domestic and wild creatures, conviviality, tradition, hunger, belonging, snobbery. Roast dinners, fish and chips by the sea. It is hunting deer and keeping chickens, curry on a Friday night when you were a student. It is visiting the markets of Morocco, or France, or your gran who cooked the best lemon meringue pie ever. How do you come up with a new way of interacting with the world that means all that culture stored inside of you and everyone you know, constantly reflected from shiny magazine pages, on TV screens, on your best friend’s Instagram, has to go? Roland Barthes observed in his seminal work Mythologies how the modern left faltered before the sheer power and sexiness of the capitalist advertising industry. How can you match the pull it has on your most basic desire: to eat delicious food, tasting of fat and salt and sweet, ready made without effort, without thinking of where it has come from, a food without consequence, untainted by guilt. Every day feast food, seeped in the lure of luxury, convenience, pleasure, control – the defining signature of a corporate lifestyle. A humble recipe for vegan nut roast is not going to cut the mustard, any more than modern socialism has been able to counter market fundamentalism. The glamour and snobbery of high culture, and the physical desires and habits of most people, are too strong. Something else has to pull you more powerfully in another direction: something that has its roots in the land, in a deeper culture that also looks prophetically to the future, that has intelligence, meaning and ethics and still tastes good. One thing corporate dining, for all its cheffy fancies and huge glasses of wine, does not have and never will: the relationship with the non-human, with the earth, with the plants and creatures who stand to go down with us if we don’t dismantle the labyrinth. This relationship is above all things a matter of the heart. Dark Kitchen is about remembering one of the oldest and simplest stories ever told: a love affair with the fabric of life. Where did the shift away from that plate of fugu begin? I read a cookbook by Colin Spencer with a no-holds-barred description of slaughterhouses. I gave up eating meat. I read End of the Line by Charles Clover. I gave up eating fish. I read Eat Your Heart Out, Felicity Lawrence’s document about corporate control and the fate of African workers in the glasshouses of Spain and Italy. I gave up buying out-of-season tomatoes. I stopped going to supermarkets. Then I went to a documentary hosted by a local Transition initiative where Derrick Jensen spoke about the agricultural revolution and how it had decimated the wild world. Somewhere a restaurant door slammed shut and an allotment gate clicked open. 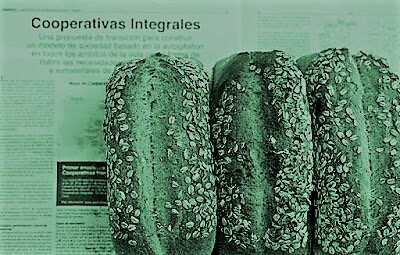 In Transition I bumped into everything that the advertising and supermarkets keep in the dark: land grabs, slavery, GM, pesticides decimating insect and bird populations, slurry from pig farms killing the rivers and oceans. I started to look at the barley and beet fields outside my window in a new light and shudder. This is the biggest issue agriculture has faced, and unlike the Depression in the 1930s and the Black Death we are not facing this in ignorance. And because we know we are responsible. People don’t want to know of course, because once you know it changes you and you are ashamed. It was a time where people on panels said these kinds of things and prophesied that bio-tech loaves and fishes would feed the 9 billion. It was a time of bringing potatoes to Occupy camps and wild weed salads to low-carbon meetings, of rescuing a whole side of salmon and punnets of strawberries from the Latitude festival recycling bins, cooking Mexican and raw food feasts for community diners. It was a time where The Monitor in the kitchen told me exactly how much power was eking out of the fridge and the kettle. When some women wept and struggled with their Tesco habit, and others implored me not to tell them exactly what their shrimp habit was doing to the seabed or the coastal mangroves of South East Asia. But something was missing. Everything I wrote had this evangelical tone. We need to reduce our energy use! Get in season! Make your store cupboard resilient! Wake up to the real price of consumerism! I realised neither knowledge nor social justice gives enough heft for people to change tracks. To be in synch with the living systems, to restore the land, to eat beautifully with conscience, to find meaning in an everyday humble meal, an imaginative relationship with the physical world had to be created. Our hearts had to be rekindled by something stronger, more alluring, than any feel-bad information. Something you never thought of before – like seaweed for breakfast on a limestone beach in September. 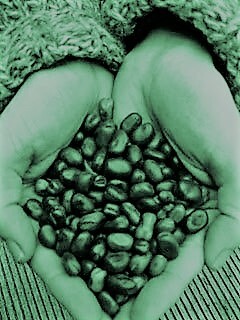 I am standing on Dark Mountain’s Base Camp stage, holding a handful of field beans. These beans are what this weekend is all about, I am telling the gathering. Field beans have been grown here in Britain since the Iron Age and embody one of the uncivilised principles of the manifesto – being rooted in time and place. The beans are produced by my friend Josiah, who started a small business in a nearby Suffolk market town with Nick and William five years ago. The beans were all about shortening the supply chain, encouraging farmers to grow a crop that was either given to cattle or sold to the Middle East, and that was nutritious not only for an eat-less-meat-and-dairy-cook-from-scratch culture, but also for the soil that is being rapidly depleted by fossil-fuelled farming. But most of all the beans were about telling a different story. A Jack in the Beanstalk story about a boy who sells his mother’s cow for a handful of beans that totally changes their luck. The beans were followed by peas of many colours, and then quinoa (grown not in Bolivia but in Essex), and now lentils, naked barley and oats, and a host of other grains and pulses, grown with the same kind of attention to place and provenance that has made local craft beers rocket in popularity in the face of corporate brewing. In short, a whole shelf of basic goods that would normally be imported, in fields that would normally host monocultural commodity crops grown for the global market. Last year Hodmedods won BBC Producer of the Year and had to move warehouses, as everyone else began to agree those beans just took you to places that Mr Heinz never could. One of the successes of the fava bean is that it is a beloved ingredient in the fragrant and spicy cuisines of the Middle East and other countries. To end each of our Dark Kitchen posts we’ll be cooking up a recipe that will capture the flavour of some of the story we’re telling, that shows though we may live in more austere restricted times, there need be no limit to our imaginations and flair and generosity. This is a classic North African dish made with fava beans instead of chickpeas and served with quinoa instead of couscous. It can serve two to four people – just add less or more veg. Soak a big handful of fava beans overnight and then cook until soft (approx 40 minutes). Keep to one side. Whole beans keep their shape but split fava is OK too if you don’t mind a bit of collapse in your cooking (no need to soak). Chop one onion and fry gently in olive oil in a largish saucepan. When softened add 2 cloves of garlic, a teaspoon of ras el hanout spice (or a mix of cumin, coriander, mixed spice and chilli pepper) and fresh green chilli if you like it hot. Stir and then add your roughly chopped seven veg which will depend on season: swede, leeks and parsnips in winter for example, courgettes, green pepper and turnips in the summer. You’re looking for a strong taste and a chunky texture, so celery and carrots are good. Cabbage however is key and can be added half way through the main cooking so it keeps its form. Stir in the spicy oil for a minute or two then add 2 tomatoes and a squeeze of tomato puree, or the equivalent in tinned tomatoes, and water to just below the level of the veg. Throw in a handful of sultanas and half a preserved lemon (or a couple of slices and the juice of half a fresh squeezed lemon). Stir, pop on the lid and cook until the veg starts to soften (about 15 minutes). Add the beans for a further five. Before serving add salt and black pepper to taste, plus a big handful of chopped coriander and/or parsley. Served with quinoa, flavoured with orange zest, cinnamon and toasted sunflower seeds, a bowl of slaw or salad, and some feisty harissa. The Dark Kitchen series will run throughout February, but will continue as an occasional series when the new-look Dark Mountain website is launched in mid-March. If you would like to contribute in the future, do get in touch with a short description of your piece to [email protected] Thanks all and bon appetit!